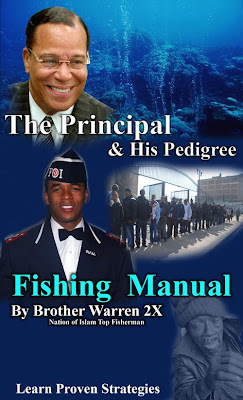 Brother Jesse Blog: A True Fisher of Men: Brother Warren 2X of Chicago casts his net in the streets of Houston and gets nearly 50 guests! A True Fisher of Men: Brother Warren 2X of Chicago casts his net in the streets of Houston and gets nearly 50 guests! His name has been called numerous times by the Honorable Minister Louis Farrakhan as being the Top Fisherman in the Nation of Islam (NOI). Recently, Brother Warren 2X journeyed from Chicago to Houston to share his strategies on fishing with the members of Muhammad Mosque No. 45. Not with just talk, but action. "My primary purpose is going after the people", Bro. Warren said. "Everything else in my life is secondary." When we in the NOI say 'fishing', we're not talking about rods, worms and coolers, although they are symbolic. But rather we're talking about fulfilling that which Jesus said "Come, follow me and I will make you fishers of men". That's our sole purpose and since Bro. Warren has proven to be the best, Houston Believers wanted to learn in person. He arrived in the city for the first time ever on Thursday, July 9 and wasted no time casting his net. He and other brothers of Muhammad Mosque No. 45 started visiting local shelters to invite people to attend the upcoming Sunday mosque meeting. He continued this pattern of teaching, training, motivating, and enlightening the seemingly hopeless for four consecutive days on the grounds until the morning of Sunday, July 12. Crowds surrounded him as he energetically spoke on how they can change their lives by coming to hear the Teachings of the Most Honorable Elijah Muhammad. They agreed, signed up and van loads arrived at the Mosque on Sunday to hear a powerful message by Student Regional Minister Robert Muhammad. Bro. Warren fished a total of 49 first time guests! The evening of July 9, there was a welcoming reception for him at the mosque and he spoke to those in attendance about strategies that have made him a successful fisherman. Many of those strategies are now compiled in his newly released book "The Principal and His Pedigree: Fishing Manual". Interesting you are using Jesus' metaphor of evangelism in this way, to spread not the news of Jesus Christ as Lord (as heinstructed His followers to do prior to His acsencion), but rather how many can change thier lives via the teachings of Elijah Muhammad. I am curious to know by what you believe makes a true fisherman? If we are to continue in context to what Jesus was speaking about in this metaphor, we can see that His evangelism was not to preach of another one to come, but rather preach in the truth that He Himself was/is, which was God incarnate, something He proclaimed Himself to be on more than one occasion. @strivingtobelikechrist I think you need to go back and read your Bible again. I am a Christian and no where in the Bible did Jesus tell us to worship him, he said follow him. Jesus never said he was God. If he was God, who did he pray to? I think you are trying to be divisive when these brothers are doing great work for our communities when most of us in the church is doing nothing but talking the word....the NOI is practicing it. I applaud them and I think Jesus would too. Look at John 14: 16 when Jesus said "And I will pray the Father and he shall give you another Comforter, that he may abide with you." 12 "I have yet many things to say to you, but you cannot bear them now.13 When the Spirit of truth comes, he will guide you into all the truth; for he will not speak on his own authority, but whatever he hears he will speak, and he will declare to you the things that are to come. 14 He will glorify me, for he will take what is mine and declare it to you. 15 All that the Father has is mine; therefore I said that he will take what is mine and declare it to you. Who is Jesus talking about here? You need to study a little more. On another note thank you to the men of FOI for all that you do. You are an example of what the church needs to be doing. I find it truly amazing you could say you are Christian but do not believe Christ is God, and that we should not worship Him, though the whole of Christianity is based upon Christ. I would suggest you read John 8, John 3,John 1, shows that Jesus indeed did say He was God. I would agree, that those in the church should act and help the people, and many Christians do. Also I would say while many may go out and feed the hungry, the food are feeding may not be for thier good. There are no attempts to be devisive, only honest and forthright about who Jesus is, since there is no shame is quoting Him. Please email me at strivingtobelikechrist@gmail.com and we can continue this conversation. you are quoting Christ as if to say this is Christ proclaiming another prophet, however this is referring to the Holy Spirit, 3rd persion of the Trinity. If Mohammad was to glorify Jesus Christ, he would have done as Paul, Peter, and the other apostles did and proclaim Him as Lord, not advise others not to worship Him. In love I suggest you read the Book of John, particularly John 1, 3 and 8. Once again, the Church should be active, and in some places it is. I would encourage you to come to the University of Houston and the Churches around and see Jesus working miraculous things via programs all througout the year. The Church should be serving others, feeding the homeless, and proclaiming the name of the God-Man Jesus Christ, and no other name. I enjoy good dialogue and I definitely do not take it for granted that you all have taken the time to comment on my blog. I thank you. Although I feel that at the end of all forums, dialogues, panels, conferences, workshops, etc, there must be some action to go along with it, I would like to weigh in on this discussion based upon some comments made by @strivingtobelikechrist. But I still plan to email you. But since you posted publicly I must address you. 1. In John 8, which you just cited, Jesus said in the 42 verse "If God were your Father, ye would love me for I proceeded forth and came from God, neither I of myself, but he sent me." Question: If Jesus is God, who is this Father? 2. In your response to the second commentator you said "you are quoting Christ as if to say this is Christ proclaiming another prophet, however this is referring to the Holy Spirit, 3rd person of the Trinity"...but hold up. In your first comment you said to me that "we can see that His evangelism was not to preach of another one to come"
It is obvious that you are not dealing with the point at hand. The word "He" represents a personal pronoun. you said "3rd Person" not "3rd Spirit or Ghost"..How can a 'spirit' (ghost) lead us into all truth? 3. You are consistently asking me on this blog and on Twitter what makes a true fisherman. What did Jesus do for those in spiritual darkness? He opened their eyes, their ears and their tongues, right? Well no matter what you personally may think of the Honorable Elijah Muhammad, the Honorable Minister Louis Farrakhan and us as their followers, our sole mission is transforming lives....and if you do not think we have been successful, I respecfully ask you to Google our history since 1930. Go to Finalcall.com and purchase our books. Do research for yourself and don't depend on the media, an opposing preacher, or a movie to dictate your posture towards us. 4. Next you said "Also I would say while many may go out and feed the hungry, the food are feeding may not be for their good. ".....this is the same thing the naysayers said about all of those who did the works of God. But the former homeless men/women, the drunks, the prostitutes, the drug dealers, the gangbangers and even the college educated such as myself will have to beg to differ with you because the proof that the message of the NOI can transform lives is evident by our revived condition. When Jesus went to trial he said nothing because it wasn't his trial. It was the trial for the blind man that he helped to see again....We stand as a witness. 5. Lastly, what good is it for us to debate scripture when people are dying in the streets daily? Our young brothers in prison? Young people in schools being miseducated? We are only as good as the results that we get. I am in your city. Let's unite our efforts because a wino could care less about the label on the bottle, he only cares about the content. Our label don't mean anything to a man in the streets trying to change his life....that crosses all color lines. And I personally thank Bro. Warren 2X and others who are not afraid to go out into the streets to save people's lives....I was out in the heat of the streets today with my fellow brothers. Thank you all again for your comments. This is your blog. May Allah reward your service and labor of love for this cause. It is truly an inspiration and I will consistently pray for the success of Believers such as yourself and Bro. Warren 2X. "You Can Tell The Believers -- They Are The Successful Ones"
To the person criticizing the wonderful work of the NOI... respectfully sir, your interpretation of the scriptures reveals that you are a victim of the old slave teaching. My advice to you is to study The Teachings of The Most Honorable Elijah Muhammad for 33-35 years with an open heart, or until Allah (God) establishes his kingdom here on earth... which ever comes first. After that, you'll be free, and your eyes will come open. Bro. Warren, keep working blackman! Your work is inspiring all of us to increase our efforts. It is contagious! AS-Salaam Alaikum Bro Waren may Allah bless you I am also top fisher in Mosque #35 MGT &GCC . Thank You for sharing its good to know a Beliver to understand the work is in the Stree. Keep up the good work your sister in the struggle Sister Lorraine 2x come join us on beliversonlyforum.com and share with us,. I thank everyone for their comments and would like to let everyone know that I have passed my phone number on to @strivingtobelikechrist and God Willing we will be talking this week to see how we can work together in Houston. This is a wonderful article. Thank you Brother Jesse for this and thank you for reaching out to that brother in unity. And I like the way you responded. Very respectful. I see a lot of hostility. Is this what the youth of the world has to look forward to? We grow up seeing our parents' arguments over who's wrong or right on which subject. We've seen massive graves carved into this rock over these ridiculous subjects. You people are foolish! All of you! Live in peace and unity! We are the only ones we have! All we can do is pray to our "invisible friends" AND HOPE for peace. As a voice of the youth I say...GET OVER IT! And look to your family! Take care of your brethren! Take care of your neighbors . Stop all this useless bickering. Do all of you really think your tiny little minds can comprehend and explain the creator of this entire existence? Don't flatter yourselves! Keep up the good work Bro Warren. I have your DVD and I played it for my sons to show them how to fish. I am glad that you have written a book and I pray that you will tour every city to show that it can be done no matter where you go! May Allah continue to protect you and guide you. I recently sent time with you Warren Jackson at Cook County Juvenile Detention Center. You spoke to about 100 youths on career day about loving self, changing one's mind set and becoming a better human being when released from prison. You also offered them the opportunity for employment after release. I think you are doing a wonderful job with the youth, keep up the excellent work.